« How can I consciously reprogram the negative mind with crystals? Did you know that April has been officially named “Stress Awareness Month?” It seems appropriate, as millions of Americans tackle their taxes this month. Stress is certainly an issue that we deal with, as the pace of life continues to accelerate in our already over-scheduled realities. Being stressed not only affects our mental and emotional well-being, but it also permeates down into the cellular level and can have serious consequences for our health. When stress hormones flood our bloodstream, they spike our blood pressure, heart rate, and glucose levels. Hormonal responses to stress also suppress the immune system and inhibit proper digestion. Many people live in chronic stress, and sometimes the causes of the stress aren’t going away anytime soon. While you can’t always control or change stressful situations, you can learn how to manage your response. Lithium Quartz is one of my favorite crystals for moving into the peaceful flow of the higher dimensions and clearing the energetic roots of stress, anxiety, and fear. Lithium Quartz is a high vibration Quartz crystal that contains a powerful combination of Lithium, Manganese, Iron, Aluminum and Kaolinite inclusions, giving this crystal a pinkish grey or lavender color. All of these work together synergistically to make Lithium Quartz a stress-busting powerhouse. Stones with a Lithium content are nature’s version of Paxil. They bring us back to center and help to eliminate feelings of anxiety, stress, depression, worry, and fear. Lithium stones also have the ability to activate the third eye, tuning us into the calm energy of the higher realms. Manganese has a grounding quality that brings emotional balance and physical healing. Iron balances the mental and emotional bodies, and according to Crystal Expert, Melody, can connect us with ancient healing techniques of Lemuria. She also says that when Iron is combined with Quartz, the effects are amplified and the vibratory rate is raised to a mastery level. Kaolinite can assist us in processing and clearing problematic life situations, while bringing a smoother flow. Since all of these calming, balancing, and healing minerals are inside of Quartz, their properties are strengthened and amplified, making their combined energy greater than it otherwise would be. I am a person who is naturally prone to anxiety and an overly active mental body. Lithium Quartz is the first crystal I turn to when I feel these frenetic states coming on. As I am writing this article, I have actually secured the Lithium Quartz, that is pictured to the left, directly over my third eye. What I initially notice is that my breath naturally starts to slow down and smooth out any time that I do this. Just this simple act of encouraging deeper breathing starts to bring a sense of calming relief. I also feel my mental energy and thoughts slowing down–it’s a sense of coming back to center. Then I start feeling waves of pleasant energy washing over my third eye, and then reverberating through my entire body. It’s as if this stone delivers the calming touch of Angels, a gentle sensation that is also very powerful, easy to feel, and fast-acting. The Lithium Quartz vibration can feel as if you are immersed in a pink bubble of blissful, higher dimensional energy. It lifts your consciousness beyond lower emotional and mental states to a realm of peace and harmony. This makes Lithium Quartz a perfect crystal for anyone who has problems relaxing, letting go of stress, or with insomnia. It is also wonderful support for anyone who experiences anxiety, panic attacks, and depression. 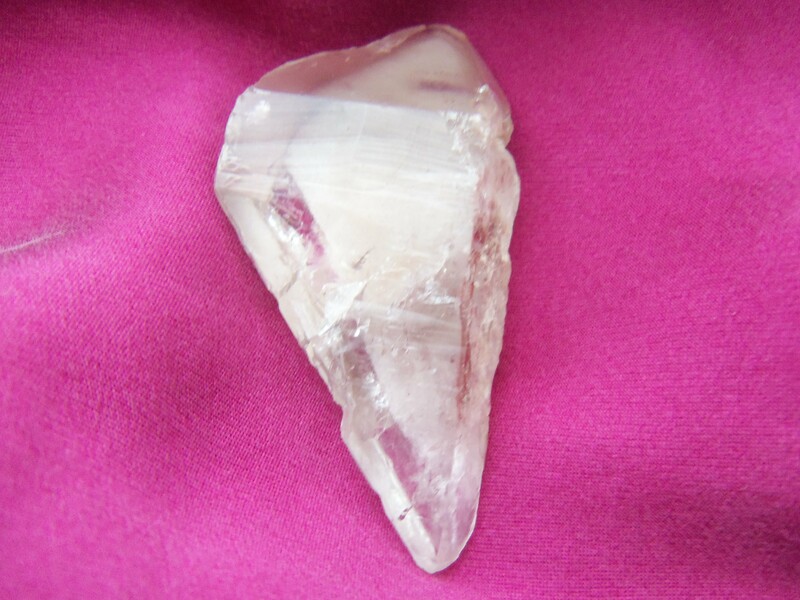 There is definitely a sense of energetic housecleaning and higher attunement with Lithium Quartz. It can transmute and release negative attachments and energetic patterns from any chakra or energy center in the body. This makes Lithium Quartz the perfect, versatile tool for healers, who can place them anywhere on the body where discordant energy is sensed. It will clear the disharmony, while bringing in positive, healing, higher dimensional light. Lithium Quartz gets you in touch with your higher heart and higher mind, helping you to come from your higher self perspective. It is very useful as a meditation tool. Lithium stones naturally calm you down and activate your third eye. So when you meditate with Lithium Quartz on your third eye, it is easier to see visions and to receive information and guidance from higher sources. I do believe that Lithium Quartz can bring in downloads and higher light codes. I have seen this happen in my healing sessions. Clients have been able to see and feel coded information coming into their higher energy centers. I have also had the experience of holding a Lithium Quartz crystal and watching etched triangles suddenly appear on the face of the crystal! Also known as records, these triangles that appear on Quartz represent coded information. If you are among those of us who are experiencing any form of stress or overwhelm this month, I would like to suggest a Lithium Quartz stress clearing activity. You will need at least two, but preferably three, Lithium Quartz crystals. Before you begin, cleanse the crystals and call in spirit to guide and support you. Put on some very calm and beautiful music, then come into a relaxed, reclined position. If you have three Lithium Quartz crystals, place one on your third eye chakra, at the center of your forehead, and one over the center of your chest at the heart chakra. You will hold the other in your dominant hand. If you have only two Lithium Quartz crystals, place one on either your third eye or your heart, depending on which center you feel needs it most. Then hold the other Lithium Quartz in your dominant hand. Start by taking several long, deep, centering breaths. If you are in a state of panic or anxiety, focus on making the exhale even longer than the inhale. This signals your body to begin calming down. Begin to consciously relax all of your muscles, beginning at your head and moving down to your feet. Allow yourself to be bathed in the peaceful, pleasant Lithium Quartz energy. 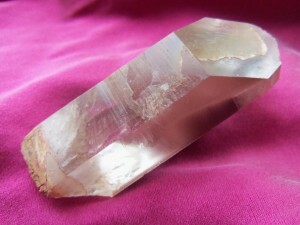 Once you feel as relaxed as possible, you are going to use the breath and Lithium Quartz to expel stress from your body. Begin by bringing into your awareness a situation or thought that is triggering stress, worry, or anxiety in you. (For example, “My taxes are due in a few weeks!”) See if you can tune in and feel where this energy is residing in your body. Now hold the Lithium Quartz that is in your hand a few inches from your face. Take a very deep breath, and imagine that you are gathering all of the energy of this stressor into a ball in the diaphragm area. Hold your breath, and collect all of this energy. Then forcefully exhale through the mouth, consciously sending this stress energy out of your body and into the Lithium Quartz. Check in with yourself and see if there are any more situations that are causing a stress response, and repeat this technique to clear them all. Once you have cleared as much stress as you can, return to normal breathing. Allow yourself to float in a meditative space, and be open to receiving any energy, messages, and advice from the higher realms. End the meditation by imagining yourself fully encased in a pure, pink bubble of Lithium Quartz energy, surrounding you at least twelve feet in all directions. Seal this bubble in gold, and then open your eyes. To continue to receive the peaceful, higher dimensional energies of Lithium Quartz, you can use medical tape or a bandaid to secure Lithium Quartz to the center of your heart or over your forehead. Be sure to throughly cleanse the Lithium Quartz that collected your stress. Wishing you all a relaxing April, and remember this profound quote: “The time to relax is when you don’t have time for it.” –Anonymous.